Carbon Masters is a carbon management company with a passion to help organizations reduce their carbon impact and adapt to inevitable climate change by replacing fossil fuel consumption with innovative, clean energy and other low carbon solutions. 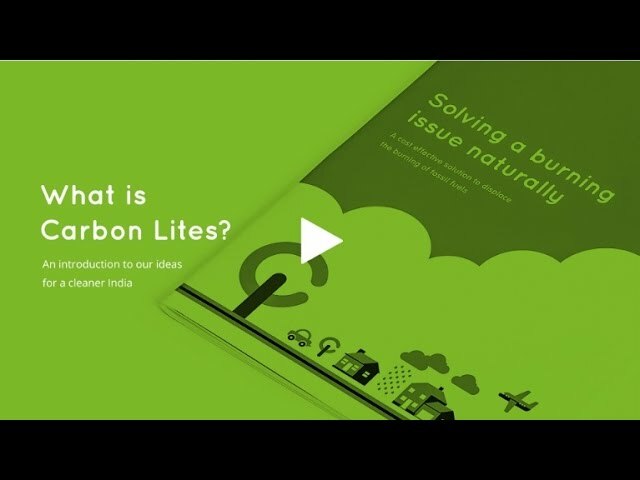 It seeks to deliver its purpose of reducing carbon emissions via a large scale disruption of the energy, municipal solid waste management and agricultural sectors in India behind their Carbonlites initiative. - Complete end to end control and integration of the waste to energy supply chain. The end goal is the rapid deployment of a large scale, decentralised waste-to-energy infrastructure across both rural and urban India that produces at scale Carbonlites biomethane in applications for cooking, transport and back-up power generation as well as organic fertilizer. Carbon Masters strives to facilitate a low carbon circular economy by collecting biodegradable wet waste and turning it into compressed bio-CNG under the Carbonlites brand. Gas is stored in cylinders and sold to restaurants as an alternative to LPG. It has been reported to generate 8 – 10% cost savings because it burns longer and stronger than alternative fuels like LPG and cooks at a constant pressure making it preferred by chefs for cooking. Carbonlites is also suitable as vehicle fuel. Carbon Masters’ collection and delivery trucks run on Carbonlites. Carbon Masters close the loop by processing the digestate slurry into organic fertilizer and selling that to farmers. The whole circle displaces wastes from landfills, mitigates methane emissions, generates carbon neutral energy product that displaces fossil fuels, and produces high-value carbon-enriched fertilizer that can displace chemical fertilizers and improve soil health and fertility. Carbon Masters is raising USD3 million to finance its projects and expansion. In cities like Bangalore, India, more than 4500 tons of waste is sent to landfills every single day. Landfills adversely affect communities around them and pollute groundwater tables. The organic waste dumped at landfills releases methane – a toxic greenhouse gas that is the major contributor to climate change. India is now the second largest market in the world for LPG but imports 39% of its requirements. This reduces its energy security and increases its overall carbon emissions. The indiscriminate use of chemical fertilizers coupled with low addition of organic matter over the years results in nutrient deficiencies in Indian soils. Excessive use of nitrogenous fertilizers could also cause ground water contamination. This is leading to flat to declining yields that are now impacting farmers' incomes. Carbonlites addresses all three issues. Carbon Masters (CM) produces Carbonlites (bottled bio-CNG) and Carbonlites Organic Manure from biodegradable wastes through anaerobic digestion in its facility in Karnataka. For waste bulk generators, CM developed Carbonlites-in-a-box - a fully functioning biogas plant housed inside shipping containers. Fully customizable, it processes organic waste on-site in just one-third of the space occupied by a conventional biogas plant. Recently, CM secured a contract with Mahindra Powerol, the generator manufacturing arm of Mahindra & Mahindra Group(M&M). Under this partnership M&M invested 90% of the capex for a large scale waste-to-energy facility. CM have an 8-year contract to operate the plant and sell the products under the Carbonlites brand. M&M plans to build 100 such plants across India, 8 in the next 24 months. CM developed a landmark pubic-private partnership with the BBMP in Bangalore. CM will design, build and operate 5 x 10tpd waste-to-energy facilities in 5 wards in Bangalore. This is an innovative Capex no Opex model for the BBMP whereby they invest 85% of the total capex and CM invests the balance. CM will build the plants and then operate them recovering opex and a return on its capital contribution from sales of Carbonlites gas and fertilizer. Eliminates and reduces the load on landfills. Carbonlites is renewable natural gas that burns longer and stronger than alternatives such as LPG. Carbonlites Cylinders are India’s first branded, bottled Bio-CNG. Carbonlites Cylinders can be used as alternatives to LPG for cooking purposes. We have developed bespoke infrastructure e.g piping, unique cascades with 2-4 cylinders, pressure reducing systems, and burners that can make the changeover from LPG to Carbonlites both safe and simple to do. Our users report total in-use cost savings of 8 - 10% after switching over to Carbonlites. What’s more, unlike LPG, it’s also 100% carbon-neutral in use! This product is ideal for anyone with bulk LPG usage such as commercial kitchens, hotels etc. Many communities and organisations in Bangalore and other Indian cities, such as IT parks, apartment blocks, temples, colleges and large manufacturing sites generate large quantities of food waste on a daily basis. This waste has to be disposed of as often as it is produced. For most of these organisations, space and cost constraints prohibit them from building a conventional biogas plant. Carbon Masters has now developed an innovative solution for that problem. We call it Carbonlites-In-A-Box. This is a fully functioning biogas plant housed inside refurbished shipping containers. It’s completely customizable and can process organic waste streams from 500kgs to 5 tons and produce up to 250kgs of Carbonlites (equivalent to its weight in LPG) per day. It could also produce 10,000 litres of liquid fertilizer. It does all this in just a one-third of the space occupied by a conventional biogas plant. Its carbon mitigation in a box - by not sending organic waste to landfills, it avoids methane emissions; by processing waste on-site, it avoids diesel emissions from pick-up trucks; and by producing Carbonlites bio-CNG, it displaces LPG, further reducing emissions. It also saves rising pick-up charges and LPG costs. Carbonlites Organic Manure is synthesized from the digestate produced while making Carbonlites. It fixes biological nitrogen in the soil and makes it readily available to the plant. It improves crop yields and soil properties and can help farmers reduce or displace the use of expensive chemical fertilizers. It can be used for growing organic food which is a fast growing trend in India. Carbon Masters uses trucks running on Carbonlites - compressed-CNG to collect food wastes to process them into higher value products. Significant volumes of wastes are displaced from over filled landfills.